When looking for a new home you want great communities, outstanding value and a floor plan that suits your lifestyle. It’s also important to have a new home builder with a reputation for building quality homes with the most modern construction methods, backed by a home warranty. Look no further. CareFree Homes builds new homes for every lifestyle and is known for constructing exceptional new homes with solid craftsmanship. Every new home built by CareFree Home starts with an innovative home design and is offered with the latest interior design trends. Our new homes are covered by a home warranty that covers your home for ten years against structural defects. All of this gives you the peace of mind that you’re buying a new house that you can turn into a long lasting home. We look forward to welcoming you and your family to the CareFree Homes family of highly satisfied home owners. How can I help? Just ask. Schedule a private tour? How to start the home buying process? Hidden Village—available in northeast El Paso and located just minutes from Loop 375! 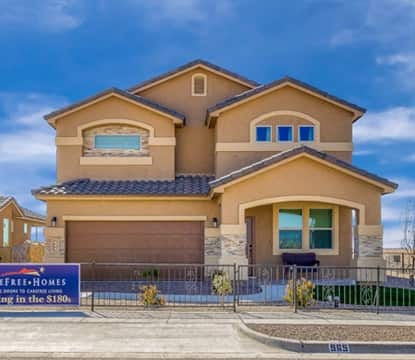 This community has convenient access to Fort Bliss and has panoramic views of the Franklin Mountains and is located in the popular Ysleta Independent School District. Horizon Town Center—located in the fast growing area of Horizon City. Beautiful, quiet, nearby parks, and great schools. Affordable one and two-story home designs with easy access to I-10 and Joe Battle Blvd. Take a quick peak into our brand new state-of-the-art design studio. Once you contract on your home you’ll be inspired by the hundreds of fixture and finish options to make your space uniquely yours. From granite options to faucets our design experts will help you along the way. Don’t know where to start? Understandable. CareFree Homes makes the entire home buying process effortless from when your contract is accepted to warranty appointments. And, if you need to know how much home you can afford get in touch with one of our many preferred lenders. At CareFree Homes, our goal is every homeowner’s complete satisfaction. From our professional sales department, to our expert design consultants, everyone takes pride to make sure the home buying process is a success. We’re honored of what our homeowners have to say about us, in fact, we invite you to read some of the thoughtful testimonials from satisfied homeowners. One good reason is our 10-year structural warranty and a Customer Service Warranty Department. Our representatives are specially trained to answer questions you may have about your new home. See many more top reasons when it comes to buying new. My wife and I are very pleased with our new home. We love everything about it. CareFree Homes has been tremendous and the staff are super friendly, supportive and professional. Great experience overall.